What is the first time you heard about service automation? I first heard about service automation being discussed in the early 2010s, though automation on its own has been something we’ve been hearing about in data center environments in terms of process and processing automation for much longer. What is your opinion on the impact of service automation on technology and people’s lives? What do you see as the main benefits of service automation? The most significant benefits of service automation are that it can free up IT staff to work on bigger and more important initiatives while also saving money and providing 24/7/365 service to customers. How do you apply service automation in your organization? 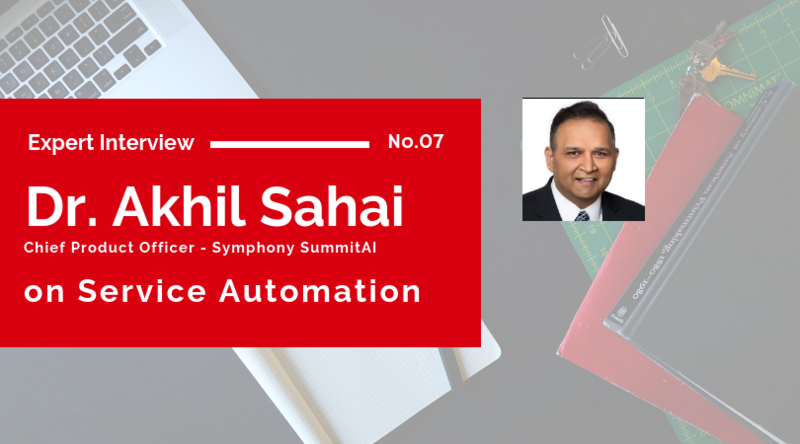 At Symphony Summit, we’re using AI and automation to bring together service, asset and operations management together to work in concert. Our SummitAI offering uses machine reasoning and codeless workflow-based automation to improve customer experience, increase productivity and speed of execution, and reduce IT operations costs. What are key lessons that people need to think about when designing automated services? At the basic core of automated services is the need to serve people in the best way possible. We’ve definitely all seen plenty of examples of automation done poorly (think about the times you’ve had to deal with clunky automated phone systems that never seem to actually get you where you need to go). Just because something can be automated doesn’t mean it should be. It’s important to really evaluate what services can be automated well with maximum positive impact and which services need to remain manual. Has the Service Automation Framework been beneficial in your organization? We use service automation extensively in our organization. One example is that we use it for onboarding employees, to help make the experience of their first day positive and productive. We’ve also automated the cloud access for our demo engineers across the globe. They can simply go to the portal and put in a request with specifications, and the access is granted. How do you see service automation developing towards the future? We believe that adoption of artificial intelligence and automation will increase rapidly over the next couple of years, as organizations discover more and more mundane tasks that can be automated. This will free up IT service employees more than ever before, giving them more time to focus on bigger and more important issues while also providing employees with 24/7 IT services. We also predict that service automation will continue to move beyond the IT department to a more holistic enterprise service management situation, where other departments such as legal and human resources can also benefit from service automation. In fact, we’re already seeing many companies are starting to move away from the traditional siloed approach and look to how one solution can be used across multiple functions and divisions. This will be a trend that continues to accelerate. Previously, he was the chief product officer at LexisNexis, where he headed a $250M+ product portfolio spread across Europe, Africa and the Middle East. Prior to that, as head of product management and marketing, he led early stage AI/machine learning based start-up Perspica Inc. to successful acquisition by Cisco. He also initiated, funded and managed enterprise-wide solutions programs at HP and worked in product management at VMWare, where he launched vCloud software. He has a doctorate in computer science from INRIA France and an MBA from the Wharton School of the University of Pennsylvania. He holds 17 technical patents, has authored a book and has written more than 80 peer-reviewed articles.